« Announcement! Signed With Entangled Publishing!!! 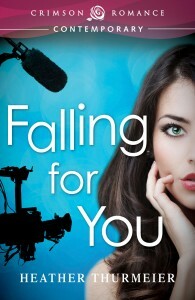 Zoe Oliver never wanted to be on another reality TV show… until Chip Cormack made an offer too good to refuse. He’s guaranteed her a payday this time and a chance to redeem herself in America’s eyes. But Zoe worries she won’t be able to focus as her desire for Chip grows and her strength to resist him weakens. When she learns she’ll be roughing it in the woods with Chip and without luxuries like indoor plumbing and electricity, she’s instantly on edge, feeling naked and terrified that her scars will be exposed and her secrets revealed. When Zoe’s past turns up on the show, she fears she’ll lose not only the life she’s sacrificed everything else to have, but also the affections of the only man she’s ever trusted with her heart. And it’s already up on Goodreads, so add it to you TBR pile today! AVAILABLE ON AMAZON/NOOK July 1st, 2013! Haven’t read the rest of the series yet? Shame on you… 😉 Check out how the series got started with Cassidy’s Story in FALLING FOR YOU! And don’t miss Paige’s story in STUCK ON YOU! That is a nice cover. good job! Thanks, Eileen! I’m really happy with all of the covers in this series. They go together so well!